Here is installment #3 of the four sets of reader submissions of inane remarks (ostensibly) uttered by electronic-challenged nincompoops. One of the funniest - and even believable - is about 300-ohm twin lead antenna wire flattening out the picture with color television. If you have funny anecdotes you would like to have published, send them to me and I'll be glad to add a few seconds to your lifetime allotment of 15 minutes of fame. Curbing the tide of entries to our contest on nonsensical remarks about electronics has the appearance of an impossible task. And why not? Surely you've heard a wild, implausible, or inane remark about electronics. Send it in and you may win a soldering gun - so you'll be able to turn the heat on when the next remark is made in your presence. Typical remarks have appeared in the July, September, and November issues. Best of the Lot. Since our last "Sequel," the comment that got the biggest reception here was one made by a bright-eyed secretary who, when asked (over the telephone) if a missing carton of capacitors had arrived, replied, "No, but there's a box full of farads." Talk About TV. About half of the entries received in the past month have been about TV - installation or repair. As might be expected with such a popular topic, there are innumerable duplications. The most common TV tale is about the housewife who sees all of the dust inside the TV set. Since most wives are unnerved at the sight of such filth, they set forth and wash out the insides with Soilax - or a similar cleaner - whereupon the husband in question tightens all loose screws and bolts. As far-fetched as this might sound, it apparently has happened from coast to coast - many times over. Confusion about color TV is a dominant topic and we couldn't help laughing at the recommendation not to use 300-ohm twin lead because it "flattens out the picture." Or at the story of the housewife who, having moved back into the hills where electric service was not available, asked the technician to "change her TV over to gas." Now Come the Puns. Possibly because some of the "real life" remarks are too silly to be believed, many readers are submitting puns and other jokes. It's impossible to resist publishing some of them although this was not the original intent of the "No Gun" contest. 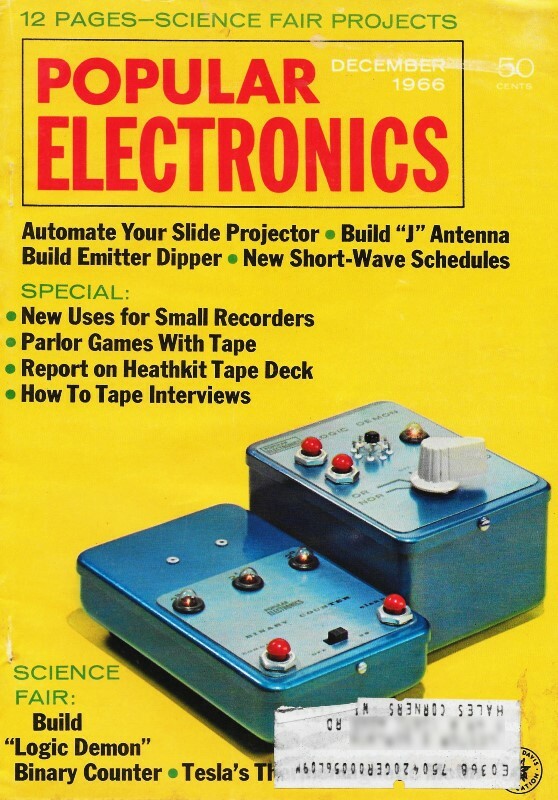 The editorial staff particularly liked the letter from a bionic laboratory that asked for a soldering gun because they "wanted to attach a resistor to the stove - they always wanted an ohm on the range." And the one about the electronics technician who had been working late and arrived home to be greeted with, "Oh, Henry, wire you insulate?" The "classic" pun is so terrible that only engineers will get it; but, as the story goes, a case of butter was missing from a ham club banquet. The problem was solved when one member remarked, "After all, what's Butterworth to Chebyshev?" Winners. This month soldering guns went to Thomas Collins, J. Engel, M. J. Ehrenburg, Robert MacElvain, Kevin Garrity, Walter F. Smith, and Donald Strachan. Send as many entries as you wish to "Gun Contest," Popular Electronics, One Park Avenue, New York, N.Y. 10016. The date of the postmark determines the winner in case of a tie.